Butterfly Baby Place: Giveaway Time: BIBS!!! I am giving away both of these bibs, so that means TWO WINNERS! Don't you think that's extra exciting??? They are backed with ultrasoft, super absorbent terry cloth for those big messes. They both fasten with snaps so no little fingers can yank them off when you're not looking! Please leave a NEW comment for each of these steps that you take (you must do the first one). Please leave your contact info in one of your comments so I can let you know you won! Thanks for the giveaway! Contact email nrsenadenos(at)gmail(dot)com. 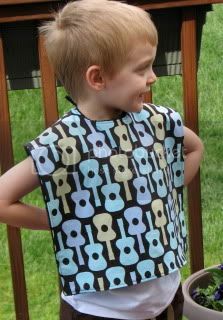 Im loving the guitar bib I am a fan on facebook and also shared the link on facebook. I love everything you make though. You can conatact me on facebook or m_andrzejczuk@yahoo.com. Thank Lisa keep up the great work. 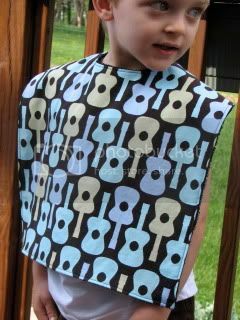 I love the guitar bib. Iam a fan on facebook and shared your link on facebook. I love all the stuff you make. You can contact me on facebook or email me at m_andrzejczuk@yahoo.com. Thanks Lisa keep up the great work. 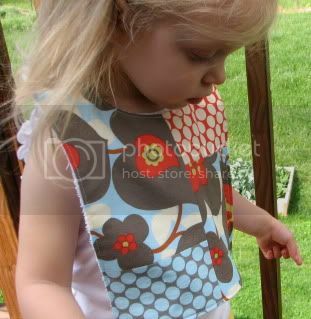 I love the Baby or Toddler Pillowcase Dress In Flora Fauna Turquoise Birds and Flowers. the fabric is to die for. I follow your awesome blog!! YAY! Cute bibs. I LOVE all of your dresses but I picked one. I also follow your blog, am a fan on FB and just shared about your giveway on FB too. Whoohoo 5 entries for me, right? Okay this is so hard! I love so many of your fabric choices I just couldn't decide! But I think I'll have to go with your Pillowcase Dress In Amy Butler Daisy Chain Natural. I love the way you do your ties for your dresses. (Making them versus ribbon) Thanks so much for a chance to win!! I follow your blog! I love it!! Checkout the post on your give way I added to my blog! Love your stuff! Posted on both my FB page and profile! Yay! Shared your page on FB!! 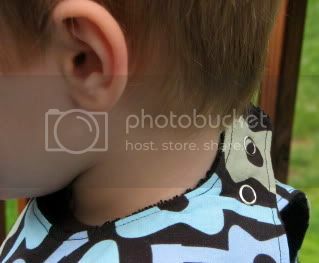 http://www.etsy.com/listing/42661874/boys-neck-tie-applique-shirt-in-all is super ccute but thenagain so is everything !!! I saw your blog and want to enter the chance to win a bib. The above item is one of my many favs. 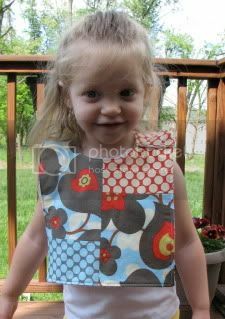 Love the reversible aprons also, as my 1 year old is getting into messier crafts these days. IF I need to do anything in addition to enter the Etsy portion of the bib entry, please let me know. I posted about the giveaway on FB entry #1. I posted about the giveaway on FB entry #2. 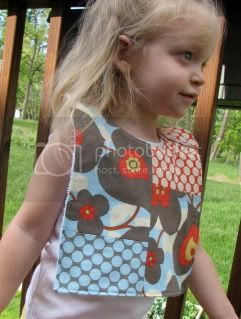 My favorite is the pillowcase dress in Amy Butler midwest modern. I really like the pillowcase dress in starling natural. already following, and as a side note (nothing to do with the giveaway) I put your button on my blog too!